According to the curatorial statement, William Cordova’s current solo show at the Mills Gallery this one’s 4U (pa’ nosotros) is apparently about “unmasking and remixing seemingly disparate and repressed histories”. I say apparently because I find it interesting to imagine that it instead addresses some other narrative: Goldilocks, for example. The gallery contains a large slightly predictable open frame “house”, two sets of images, hair ties, photographs, and something growling and articulating in a tiny room. That noise could be bears. (Angora bears, possibly, hence the hair ties). Dancing angora bears, as a matter of fact, because there are also some period-piece cardboard record-album covers installed on a wall, as well as, I think, a tin-foil boom box placed in a broken fishtank in another area of the gallery. Angry dancing angora bears, even, since there’s an object in the front space made from carefully marred Sheetrock incised with tiny (clawed??) lines and studded with shiny precious polished rocks of the sort you find in New Age stores. There are no chairs, porridge, or small famished females with boundary issues, but this renders the alternate narrative no less palatable, to create a truly horrible turn of phrase. This is not to say that I necessarily dislike the show; merely that I would never guess the focus of the work were it not for the explanatory text. I’m a looker not a reader when it comes to art shows. And besides, there are those growling sounds . . . The whole place smells of pine. I wish the artist had capitalized on this and can’t help thinking of Klara Liden’s show of abandoned Christmas trees at Reena Spaulings. The space is also filled with broken sounds. Possibly a nice touch but it also leads me to fear the emergence of some Tourette’s afflicted gent from one of the Mills side galleries. One of the Tourettes rooms contains a video loop of Jim Morrison going off the deep end at a show. I quite like it but feel sorry for the gallery attendants seated near it. It is the source of the bear sounds. 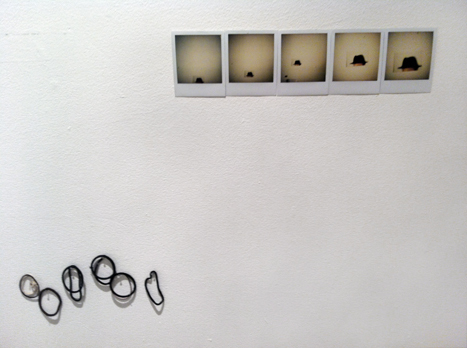 The small delicate gestures are the ones that really work for me: a row of used hair ties hanging on the wall, the set of 5 Polaroids near them, an isolated hairtie hanging lonely on an empty wall across the room. Cordova works with series and systems, but he does best with inscrutable ones where the logic is simple and the response to materials more instinctual. There’s also a nice small spotlit sculpture in the far-most room. An assemblage of feathers and a paper bag it is formally engaging and in some ways has a presence far greater than the immensely larger frame house of the main room. But the feathers look as if they once belonged to a seagull. As the work is titled untitled (geronimo I & II) I find this confusing. Surely the original G wasn’t a coastal dude? Or maybe I don’t know my feathers. These are the things that confuse me, the links that fail to connect, and the reason I keep coming back to bears. Also in the room is another video: Spanish audio mis-paired to a video of someone who looks like Tupac. More bear sounds. I’d like the house thing more if it didn’t remind me of a show I saw several years ago at the ICA in London of Oscar Tuazon’s work. 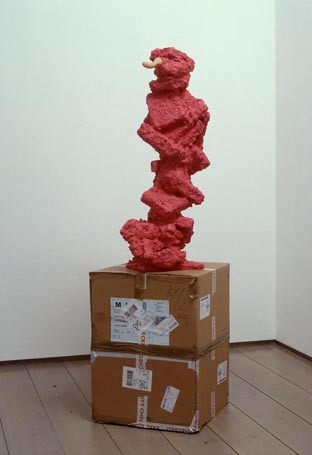 Tuazon’s pieces pushed the boundaries further (literally), sections of his more robust beams extending into and through the walls of the gallery, rendering the forms of a traditionally nurturing and protective structure far more masculine and aggressive: making a sculpture, in other words. There’s nothing transformative about Cordova’s house and I wish the plans had instead been simply drawn out on the floor: Dogville style. I really don’t know what the point of it is. My favorite part is a set of small matched sepia photos on the floor. Their level of formal engagement and abstraction pulls me out of the barren linearity of the simple 2x4s. Of course what I really wish is that Cordova had instead done a re-creation of his massive speaker piece Badussy (Or Machu Picchu After Dark): far more engaging and it would provide a linkage to the album covers. Some good subwoofers would amplify the low tones of the bear sounds nicely, too. The first time I made butter it was dead easy except I got so excited I ended up cutting my finger on the blade of the food processor. (So dead painful too, but I did manage to keep the drips out of the bowl). I made red-pepper flake butter and also pink Himalayan salt butter. Again, really easy, but you have to wash the butter thoroughly and then squeeze all of the moisture out so it doesn’t start to go sour after a few days. Butter washing and squashing with a bandaged hand doesn’t work too well so the butter lasted only a week. Making butter is a bit like working with plaster, except there’s less of a race against the clock. Plaster always astonishes me: its like magic the way it goes from liquid to solid, but usually magic with malevolence mixed in. I’m often stuck with a good chunk of hardened left-overs which the plaster fairies/angels/devils caused to seize up part-way through my project. Not so with butter. The stuff that doesn’t solidify in the churning process remains as butter milk, which is surprisingly tasty. You can drink it or bake with it and revel in the duality of its nomenclature. 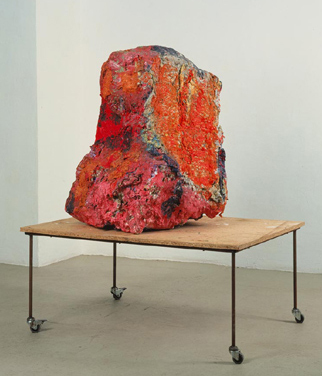 Franz West works with plaster and papier-mâché, or, possibly additionally the innards of tortured minotaurs, or the things left standing once a planet has condensed to pure dark matter. I love his work and defy anyone to argue the contrary. He’s one of several sculptors whose work I group together: Rebecca Warren, Siobhan Hapaska, and Rachel Harrison are additional names that spring to mind, although only some of Hapaska’s work fits my categorization: eccentric blob(s) coupled with thin rectilinear hard things. The contrast in materialities reminds me of the butter/butter milk divide and there’s an inherent violence and joy in the objects that reminds me of my butter blending mishap. West’s pieces can also have the look of giant mounds of tufted fat: the kind you get when you start playing with the trimmings of some uncooked beef. I’ve got some partially made blob sculptures that I need to get back to. I’d love to say I’m going to make them out of giant blocks of beef fat and keep them in a see-through fridge, but perhaps this is best imagined. And I’m going to make more butter. Formaggio Kitchen has crystallized violet petals for sale: I think I’d like to use some of them with some really really dark salt. Maybe I’ll finish the blob sculpture that’s got speakers in it and paint it purple and black. 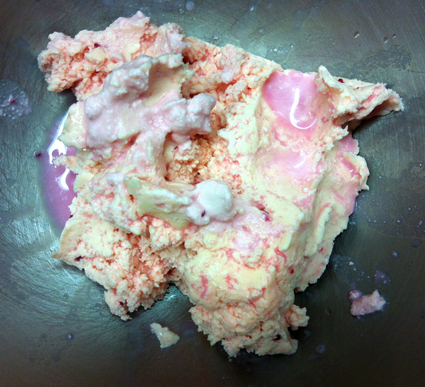 Or maybe I’ll do Himilayan pink salt again with crystallized rose petals; its almost Valentines. Butter really is about the fat. The fabrication is a simple process: take some nice heavy cream and agitate it. Shake it or beat it or blend it til you’ve made whipped cream* and then keep on going. Suddenly (see magic processes in paragraph 3) from the one substance you now have 2: the cream is replaced with solid butter and the liquid butter milk. Once you’ve stopped marvelling ***and the blade has stopped spinning*** remove the solid lump of butter. Wash it in cold water and then squeeze all of the liquid out. This is very important as any remaining liquid will sour. You can work in any flavorings at this point. I’m not sure but I imagine if your flavoring can rot it will; the butter will not preserve it so plan accordingly or use the butter quickly. *a blender or other electronic device is absolutely not necessary to make whipped cream. Put some cream in a container with a tight cover, leaving plenty of room at the top. Shake it til you no longer hear the liquid sloshing around and you have whipped cream. It takes a minute or two. Apparently you can keep on shaking and eventually make butter, but I’m too much of a wuss. I’m referring to the floating and waving objects in the Hans Haacke show at MIT’s List Center which have a greater level of autonomy than I would have expected. But then these are objects from 1967 (or recreations in some cases). Things just *were* freer back then. 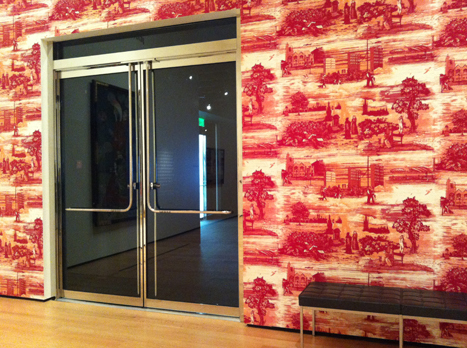 A series of prints in a separate room document other works created by Haacke while he was at MIT. Included are images of more floating things: a whole string of balloons, for instance, like a parade of white geese or rotund pre-schoolers out for a ropey walk (the one where the tinies walk in a line clutching a rope that keeps them linked together). At times it feels as if there’s a whole sub-genre of balloon work: wistful poignant photographs of balloons, balloon installations, sound artists who work with balloons, etc. Martin Creed’s Work no. 200: Half the air in an open space, 1998, for example. The Creed work uses balloons (half a room’s worth) and photographs quite well. I’ve never seen it in person. 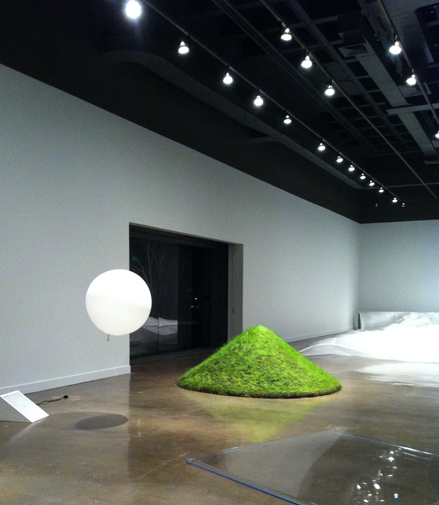 Haacke used the balloons to explore and elaborate upon the concept of systems. Hence the autonomy which seems less a force in other artist’s balloon work. 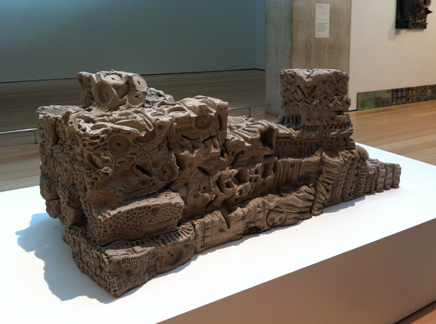 Other artist’s pieces seems more about aesthetics, or something vaguely conceptual (or even possibly jokey). On one of my visits to the List the floating corset piece (Flight, from 1965-6, recreated in 2011) dropped; something that occurs randomly and occasionally according to the gallery attendant. In some work this might seem a technical failure, something to ignore or pretend not to have seen. In the context of Haacke’s work its a rare exception, like witnessing a shooting star; something that strays from the memetic formula but is still part of the existing genotype. In science even failure can be a point of fascination. For some reason I equate balloons with birds. 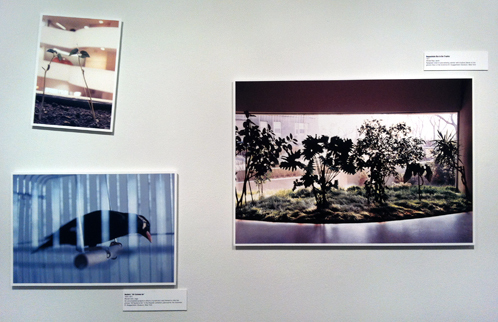 The Haacke show also contains images of birds, so maybe he was thinking the same. If the art is birds, are the viewers cats? worms? This line of reasoning has the feeling of a Russian fiction: The Master and Margarita, perhaps. In the small gallery at the List the prints are oddly hung; some “normally” but others seriously askew, leaving me to wonder if this manner of display is intentional or a mistake. If birds were the viewers and not the art they would have no issues with crooked art, mid-air re-calibration being rather a feature of their species. Ten days later the prints (which are mounted on foam-core) are still crooked, though I can’t remember if its the same or different ones. I start wondering idly if Hans Haacke is a bird, and by extension whether I would be less annoyed by the orientation of the prints had a bird been responsible. Knowing this disarray to be some sort of avian conceptual gesture would certainly make things more interesting and the artist’s talk would be delightful . . . According to the front desk staff the prints are crooked by design (I don’t ask them about the Hans Haacke=bird stuff). Ultimately I think its a nice show and I like the floating ballon and corset pieces (the real ones, not the documentation). I wouldn’t call it great. It feels a bit sparse for all that space and I’m really not sure about all those crooked prints. A dedicated iPad would do just as well for the documentation. This is MIT, afterall. Maybe if they were framed? The Otto Piene light installation in the other half of the gallery is utterly transfixing. I have no desire to write about it as it strikes me that words would diminish its oneiric efficacy. Go see it. And look up MITHenge. I can’t help imagining a connection. Lights at the Palace of Technology.